Foreign direct investment (FDI) plays a critical role in the global economy, and contributes to the growth of national economies. Emerging and developing countries, in particular, benefit from the funding and market experience of established multinationals and investors. In areas such as infrastructure, energy and natural resources it can generate additional sustainable investment. Through FDI, companies and national economies can gain access to valuable tools such as capital, technology and manpower. FDI is a sign of confidence in a region; it is a valuable source of economic growth and job creation even in advanced economies. In 2016, FDI into Europe hit a record high. There were 5845 FDI projects recorded, with 259,673 new jobs created, a 19 percent year-on-year increase according to EY. In the US, according to federal data, of the 656,000 new US manufacturing jobs created between 2010 and 2014, two-thirds can be attributed to FDI. Much of the FDI which has flowed into the US in recent years has been in the country’s southern states, where car manufacturing has boomed. European automotive giants Daimler AG, BMW and Volvo Cars have opened or are developing new facilities in the US, creating thousands of new jobs. Global FDI peaked in 2007 at around $2 trillion before dropping to $1.2 trillion by 2009 as a result of the global financial crisis. Though it picked up in recent years, it has tailed off in the last 12 months. Global flows fell by 16 percent in 2017 to an estimated $1.52 trillion, from a revised $1.81 trillion in 2016, according to the UN Conference on Trade and Development’s (UNCTAD) Global Investment Trends Monitor. Much of the 2017 slump can be attributed to the 27 percent drop off in developed countries. FDI inflows were down 33 percent in the US and 27 percent in Europe. In the UK, where there is still confusion created by the Brexit vote, FDI flows were down a remarkable 90 percent year-on-year, from $196bn in 2016. This decrease runs contrary to other global macroeconomic indicators, such as GDP and trade growth which both climbed in 2017. One might argue that these declines into developed markets represented a return to normal given the substantial increases in 2016. However, the UN previously suggested that global FDI flows would experience a 10 percent increase in 2017; instead, developed economies saw them fall by a quarter to around $810bn. Given the current geopolitical climate, it is unsurprising that global flows have declined. In the US and UK, major political upheaval has sparked concerns about the future of globalisation. The protectionist ‘America first’ policies of president Trump have created the most isolationist US administration in decades and the UK’s withdrawal from the European Union has created uncertainty around its place in the global economy. The US is looking to reform the way the country handles foreign investment, including the procedures of the Committee on Foreign Investment in the United States (CFIUS). The Foreign Investment Risk Review Modernisation Act of 2017 aims to modernise and strengthen the CFIUS process to more effectively guard US national security in the face of perceived threats from certain types of foreign investment. Alongside the CFIUS reform, in October 2017 the United States Foreign Investment Review Act was proposed, which would amend the Trade Act of 1974. The new procedure would permit the secretary of the US Department of Commerce to block or require the restructuring of any transactions that could result in foreign investors taking control of US businesses. The secretary’s decision would be made by considering a number of criteria, including economic factors, as well as long-term strategic economic interests, the “history of distortive trade practices” of the country of origin of the foreign investor, and “any other factors the secretary considers appropriate”. The procedure would also impose, for the first time, mandatory notification requirements for foreign investments that meet certain monetary thresholds. The review process would last for 60 days and would be overseen by the commerce secretary, rather than the Treasury Department, as is usually the case. Interested parties, including unhappy competitors, would also be able to comment on proposed transactions. The commerce secretary would have a wide remit to make decisions about foreign investment on virtually any economic basis without requiring presidential authority. If passed, the bill would represent a sea-change in overseas investment policy in the US. The proposed reform has attracted criticism, particularly in light of the Trump administration’s much-vaunted deregulatory approach to government. Furthermore, although CFIUS is concerned with national security, there are concerns it will be used as a means of pursuing protectionism or regulating competition. Whether these proposals will be adopted, however, remains to be seen. The UK has proposed similar reforms of its national security review powers in the wake of EDF and China General Nuclear’s bid to construct a nuclear reactor at the Hinkley Point power station. Though the investment was approved in September 2016, the national security implications of Chinese involvement in a landmark, critical infrastructure project prompted a change in the UK’s existing review system. The government has insisted that all national security reviews will be separate from any reviews undertaken by the Competition and Markets Authority. Furthermore, the government’s review powers would not extend beyond the public interest in national security and into other public interests. Despite the changing landscape, the US was still the largest recipient of FDI in 2017, receiving an estimated $311bn. China, despite a sluggish first half of the year, was second with around $144bn. Hong Kong was the third most popular destination, with inflows of $85bn. European inflows declined to $397bn, down from $541bn in 2016, though the UK accounted for much of the bloc’s decline. Yet 2017 was a positive year for a number of European economies. Inflows increased in 19 of the 32 European markets, up from 14 year-on-year. Germany rose from $10bn to $35bn, while France, on the back of a number of large M&A deals, saw inflows increase by 77 percent to $50bn. In Poland, FDI has remained steady in recent years. The country has attracted €176bn in total FDI, rejuvenating its economy. The Polish automotive industry, for example, has drawn investment from GM, Volvo, Fiat and Daimler. Cross-border M&A fell in 2017 after three consecutive years of growth. Total deal value declined 23 percent to $666bn due to developed economies, which saw a 30 percent drop to $553bn. However, it was still the third-highest level recorded since 2007. Deal activity in Europe was a disappointment, with only Switzerland performing well. The natural resources, manufacturing and services sectors all saw declines in deal activity, though the latter two accounted for more than 60 percent of total deal value. The number of mega-deals completed also fell year-on-year to 63. The decline in developed market deal value was somewhat offset by a 44 percent improvement in the developing markets, where deal volume reached $100bn. Emerging markets saw stunted growth in 2017. Despite improving economic growth, inflows increased by just 2 percent. Across developing Asia, inflows reached $459bn. The region was the largest overall recipient of FDI last year, accounting for 30 percent of all global traffic. China, Hong Kong and Singapore were the most targeted economies in the region. ASEAN inflows amounted to $130bn, with Indonesia accounting for $22bn, a six times year-on-year increase. In Vietnam, FDI is one of the key drivers of the national economy. Foreign companies accounted for 23 percent of GDP, 25 percent of total development investment capital, 70 percent of export turnover and 50 percent of industrial production value. They also employ more than 2 million people. For Vietnam the importance of attracting FDI inflows is clear as it underpins the country’s recent annual growth rates of around 6 percent. Latin America and the Caribbean saw 3 percent FDI growth to around $143bn in 2017. This was the region’s first increase in five years, though it was still down 25 percent on the region’s previous best, achieved in 2012. Brazil emerged as the most popular destination for investment in the region in 2017. Nine out of the 10 biggest Latin American deals involved Brazilian companies, and the country attracted $60bn of inflows. Mexico, in second, drew inflows of $29bn. Africa saw a marginal decrease of 1 percent to $49bn. Nigerian FDI dropped 24 percent to $3.4bn. Transition economies saw inflows fall by 17 percent to around $55bn, primarily due to less investment into the Russian Federation. Despite the protectionist and isolationist policies unfolding in the US and the UK over the last few years, FDI still has a major part to play in economic development. Governments cannot afford to put roadblocks in front of would-be investors. 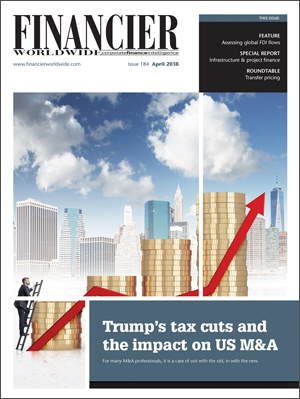 Measures such as tax reforms in the US will surely impact investment decisions by US multinationals, which will have consequences for FDI flows. Though 2018 is expected to be a better year for FDI, due to higher economic growth projections, trade volumes and commodity prices, nothing is guaranteed. And with geopolitical risks and policy uncertainty expected to continue through 2018, the anticipated FDI recovery may be somewhat muted. In the UK, the country’s future economic and trading relationship with the EU will take shape as Brexit approaches. Though there is uncertainty and no shortage of intrigue, the UK, and London in particular, remains an attractive destination for FDI. According to fDi Intelligence’s European Cities and Regions of the Future 2018/19, London beat Dublin, Paris, Amsterdam, Munich and 20 others to the top spot. London’s friendliness to business, population, lifestyle and culture should hold it in good stead. The devaluation of the pound has also drawn the eye of overseas investors. Concerns around the possible tax, administrative and regulatory consequences of the Brexit vote, however, will surely have consequences. Furthermore, the UK must strike a delicate balance between appearing open and investment-friendly and safeguarding national security. The importance of FDI cannot be overstated. Foreign investors often bring higher wages, levels of productivity and research and development activity than domestic firms. They also often drive domestic companies to improve their technologies, systems and management practices. As a result, governments should welcome FDI with open arms. While it is prudent to consider national security concerns, countries in both developed and emerging markets must remain receptive to overseas investment.